On the evening of Thursday, March 31, Leadership students came together for a combination tour of the Cherry Blossom festival and history of the memorials surrounding the National Mall. This annual Leadership event allows student to enjoy the festival scenery while simultaneously gaining insight into the leadership lessons offered by figures like Franklin Delano Roosevelt and Thomas Jefferson, whose memorials were included in the tour. Leaders from all grades traveled together to the Mall, where they were joined by National Park service tour guide and AU graduate student Tim Moore. 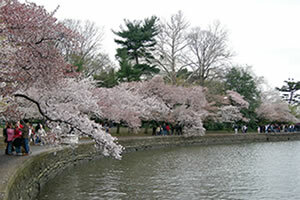 Moore, who is also a friend of former student director Stephen Laudone, introduced the Leadership students to the history of the District’s cherry blossom obsession, which can be traced back more than a century to the years of the Taft presidency. Touring during the evening hours was an added bonus, giving students the opportunity to enjoy the cherry blossoms without the crowds of tourists that usually flock to the festival during the day. For example, Moore explained how the recurring theme of water and fountains in the memorial represented the capacity and the potential of Roosevelt’s leadership to enact change in the lives of citizens, starting out calm and growing in strength as the group made its way through the rooms. Moore made a point to demonstrate that Roosevelt was never represented, in life or in his memorial, as having a wheelchair, which in recent years has angered disability awareness groups and individuals who see the former president as an inspiration for disabled individuals. “Listening to our tour guide talk about the ‘controversy’ surrounding the issue of presenting Roosevelt in a wheelchair reminded me that I always have to think of how my actions will affect others,” says Cristina Kladis, freshman in the program. Moving on from the FDR memorial, senior Stephen Laudone led the Leadership students on to the Jefferson memorial. Laudone, a veritable “History Wonk” when it comes to D.C. trivia, pointed out interesting facts and architectural features of the memorial. For instance, the Washington Monument is shifted over so there’s a clear view between the White House and the Jefferson memorial, and on the walls are four excerpts from Jefferson’s work that highlight his main ideas. The tour is a great way for students to come back together close to the end of a busy second semester. Margaret Marr, director of the program, described the tour as a way of coming “full circle” with the beginning of the year, commenting on its similarity to first semester events in Dupont Circle, when members of the Class of 2014 were just beginning to get to know one another.